Let's be clear, most bartenders out there are great. They're professional, they enjoy interacting with customers, and they work incredibly hard. But sometimes you'll come across a bartender who is not giving you what you're paying for. That could be for a number of reasons. He or she may be under orders from the owner to cut corners and save money. The customer could be difficult, or even rude. Or, the bartender is finding ways to pocket cash. Whatever the reason, here are the most common ways your bartender can rip you off. This is a sneaky way to serve you less alcohol than you paid for, by tricking your senses into smelling and tasting a strong drink. The bartender can do this in several ways, but the outcome is the same; the rim of the glass will be dipped in the alcohol of your choice, from vodka or gin, to whiskey or brandy. The easiest method is to have a sponge soaked in alcohol out of sight. You order your drink, the bartender dips the rim of the glass in the sponge, then pours a drink that's very light on alcohol. You don't realize this because you taste and smell alcohol every time you take a sip. 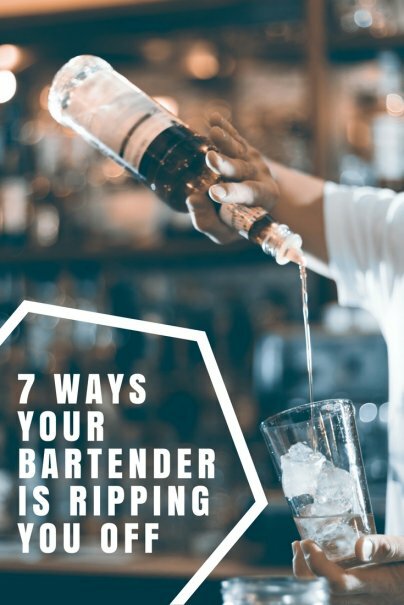 If you are watching the bartender closely, and the glass disappears from sight for a few seconds, you could be a victim of the rim dip. The easiest way to find out is to wipe the rim of the glass thoroughly with a napkin and take another sip. Is it weak? Then you've been had. To be fair, this is usually a collaboration between the bartender and the owner. But however it happens, it's an easy way to rip off customers in plain sight. The bartender will simply add water to the liquor in the bottle, be it a clear spirit, or something darker. It's only going to be around 10 to 15 percent of the bottle's volume, which makes it very difficult for the average customer to detect. But it's very profitable for the bartender and the owner. However, you see nothing wrong because the pours all look legit. This is a tough one to catch. The only way to know for sure is to test a neat shot from an open bottle against a neat shot from a bottle that has not yet been touched. And that's not likely to happen in a busy bar scenario. The simplest way to achieve the brand swap is to pour cheap liquor into empty bottles of a more expensive brand. Another way is to apply expensive labels to bottles of a cheaper brand, but this is time-consuming and tricky to pull off. Either way, the result is that you're paying for a higher quality of liquor than you're receiving. With some drinks, it's very difficult to tell, especially with vodka and rum. But if you're a whiskey or bourbon aficionado, you're likely to detect the switch. However, most bars stay away from this one as it's a crime, and can result in fines and the revocation of their liquor license. If you order a drink that naturally comes with a straw, you may be getting scammed. In this illusion, the bartender has a series of containers behind the counter filled with different liquors and straws. The straws become filled with the alcohol. The bartender will then mix your drink with very little alcohol, and add the boozy straw at the end. As you take your first sip, you will get a big hit of alcohol and think that the bartender has hooked you up with a heavy pour. In fact, you got almost no alcohol. The easiest way to spot this is to sip directly from the glass first. Then, sip from the straw. Notice a big difference? You just got played. You order a drink — let's say a vodka and orange juice — and it arrives. It tastes great. You order a few more. Then you get the bill. Instead of making your screwdriver with a basic vodka brand, the bartender has poured you one of the expensive options, such as Ketel One, Grey Goose, or even Stoli Elit. The markup on these bottles is huge, and instead of paying $7 for your drink, you're suddenly seeing $14 per cocktail. Very few bartenders go in for this practice. It's a surefire way of losing customers after just one visit. But places that see a lot of tourist traffic, and few repeat customers have been known to pull it. Just make sure you ask for the cheapest brand when you're getting your cocktails. If you're drinking neat, or with a splash of water or ice, then you will probably be asked what brand you desire.